When 17-year-old Malik Abdul-Haqq starts telling a story about ditching school early on a Friday afternoon, it sounds like the beginning of a tale we’ve all heard before. Teenagers skipping class is nothing new, especially when that teen is a high school senior, even more so when he is a star athlete and popular enough to have been voted class president. But then Malik’s story takes an unexpected turn from the Ferris Bueller-inspired montage you might expect. The unexcused absences weren’t an every-week thing. During the fall months, Abdul-Haqq stayed on campus many Fridays in preparation for that night’s game in which he’d be playing quarterback and defensive back for the Cleveland High School (Seattle, Wash.) football team. On many Fridays during the winter, his evenings were spent playing forward for Cleveland’s basketball team. And clearly Abdul-Haqq didn’t spend too much time away from where he needed to be, as his academic and athletic achievements were stellar enough to earn him a scholarship to Western Oregon University in Monmouth, Ore. 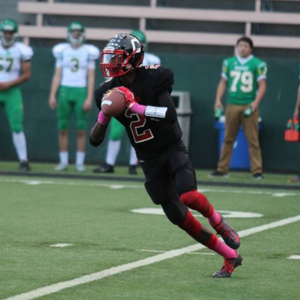 In his senior football season, Abdul-Haqq threw for 21 touchdowns, ran for another 11 scores, and had two interceptions on defense. He led the Eagles to the Washington 3A state playoffs, where they lost in the second round to finish with a 9-3 record. 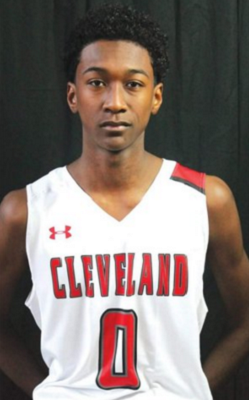 On the basketball court, the 6-foot-6 Abdul-Haqq — who has an uncle that played pro basketball in Dubai and Indonesia — averaged eight points per game and led Cleveland in rebounds and steals. The Eagles finished third in the Metro League, one of the toughest high school basketball conferences on the West Coast that features nationally-renowned powerhouses Garfield HS and Rainier Beach HS. At press time, Cleveland (22-6) had survived the Metro gauntlet and was preparing for the 3A state tournament. 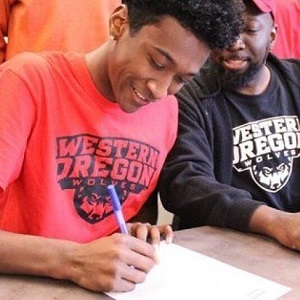 While a state championship on the hardwood would be a storybook ending to an accomplished high school career, so far the signature moment of Abdul-Haqq’s prep experience was on Feb. 3, known as National Signing Day, when he announced that he would be attending Western Oregon to play football (and maybe basketball, too). UMMAH SPORTS: What’s your favorite sport? MALIK ABDUL-HAQQ: Football. I mean, I’ve played it since I was a little dude. It’s the first sport I fell in love with. Football, then basketball. US: Were you good at football right off the bat, like a natural, or did it take a lot of work before you saw results? US: What about basketball? Were you a natural on the court? MAH: I think what carried me in basketball, honestly, was my athleticism. I just took what I knew from football and put it to work in basketball, like using my length and hustling for every loose ball. As I got older and older, I turned into a more effective weapon. US: Did you play any other sports growing up? MAH: A little bit. I played baseball for like a month or so when I was younger, but I didn’t get that serious into it. US: Who are some of your favorite athletes, or athletes that you maybe pattern your style after? MAH: Someone I look up to in the NBA would be Kevin Durant. The reason why I like him a lot is that he’s super lanky, just like me. My goal is to try to be like him; to be a perimeter player and play down low, too. In football, my favorite player used to be Randy Moss. That was when I thought I would be a wide receiver. But as I started playing quarterback, my favorite player became Cam Newton. US: What was the highlight of your senior season in football? MAH: Honestly, the whole season was a highlight. I couldn’t be any happier than to end the season with all of these dudes that I’ve played with my whole life. Everybody on the football team, we literally played together since Little League. I can’t ask for anything better than that. We have a brotherhood and it’s solid as a rock. That’s going to help mold me for the rest of my life. US: And what has been the highlight of this basketball season so far? MAH: Probably when we played Rainier Beach and I had 19 points, 10 rebounds, five steals and three blocks. That was a really good game. Then on Senior Night, my teammate threw me an alley (oop). That was my first in-game alley ever. The whole gym went crazy. US: Were you recruited by colleges just to play football, or was there also interest for basketball? MAH: I had some interest for basketball. At one point in time, I had TCU (Texas Christian University) and St. Mary’s looking at me for basketball. But most of the colleges that were recruiting me wanted me for football. US: What position will you be playing in college on the football field? MAH: I was mostly getting recruited to play safety. Everybody likes me at safety because they said they don’t usually see dudes at 6-6 who can move and be able to cut and change speeds like that. They like my length in the secondary. And it’s always good to have a dude that tall who’s willing to hit. Most colleges wanted me to play defense. But I might play offense too, depending on where they put me. US: Would you also consider playing basketball in college? MAH: Yeah, I’d like to play basketball in college. Right now, Western Oregon has me on a football scholarship, but we worked out deal where I could walk-on to the basketball team if I wanted to try. US: What are some other schools that recruited you? MAH: Wyoming, Prairie View A&M, Clark-Atlanta, Southern Oregon, Wayne State, Cincinnati Christian and Sterling College were some. US: What were the primary things you were looking for in a college? MAH: First off, we wanted to make sure that the school looked at me as a student before looking at me as an athlete. After that, we wanted to see if the coaches or if the school as a whole would be a good fit as far as the environment. We wanted to know if the people are friendly, if the coaching staff and the other players cared about me. Also, would I be able to see myself living there for the next four or five years? And if it was relatively close to home, that was a plus. US: How many colleges did you visit? MAH: We went to Western Oregon and Wayne State, which is in Nebraska. I also went on a visit to UW (University of Washington); we got to watch a game there. 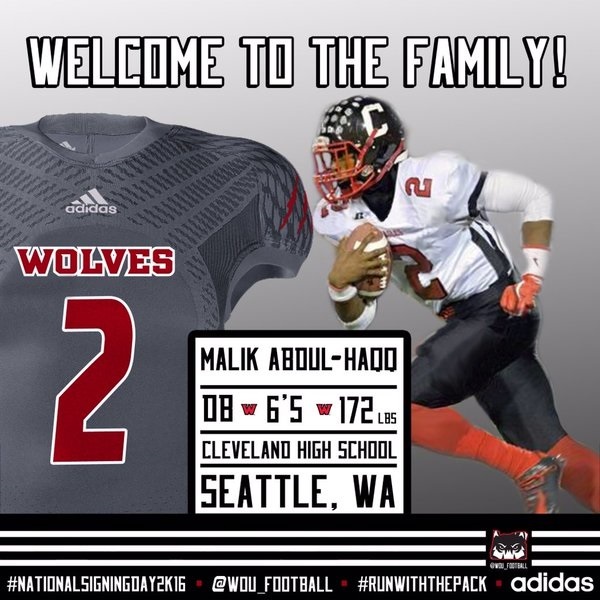 Malik Abdul-Haqq signs a National Letter of Intent to attend Western Oregon University. US: In the end, why did you pick Western Oregon? MAH: It’s super close to home. My parents will be able to come watch me play. I have family out there in Oregon, too, so that’s good. The coaching staff seemed to really have a feel for me. They made it obvious that they wanted me in their program and that they would take care of me when my parents aren’t around. When I was there on my visit I got to hang out with some of the players, and when I left, I felt like I’d been there two or three years already. They have a brotherhood, and that played a huge role. It just felt like a good fit for me. US: What are you planning to major in at Western Oregon? MAH: I want to major in Sports Management. I want to either become a sports agent, or end up owning a facility where we train college athletes to get ready for the next level and train high school athletes before they go to college. US: What role has religion played in your athletic career? MAH: It’s played a huge role. I make sure that I pray salat before every game. Whenever something good happens, I make sure I’m giving credit to Allah [swt], because He is the one controlling that. On my high school team there’s a dude named Fahad Sharif, and me and him are the only Muslims on the team. Before every game, we’ll go pray and the team makes sure to settle down and be respectful while we do that. We make salat, then we go about our business. US: How do coaches, classmates, friends and other people react when they find out you’re Muslim? Whenever they have a question and I’m able to answer it for them, I will. Like, if they want to know why I pray, I’ll tell them. Everybody is pretty cool with it. US: Do you anticipate it will be tough to stay committed to Islam when you’re in college, out of the house and on your own? MAH: I mean, there are always going to be a lot of distractions while you’re in college. You’ve gotta keep your focus on why you’re there — to get an education and play the sport that you love — and also you’ve gotta maintain your religion. That’s what my goals are. My parents basically embedded in me what my main focuses are when I go to college. Be about your business, and when it’s all said and done, you need to praise Allah [swt]. US: Did your religion come up at all when you were being recruited? MAH: Nah, not really. There were a couple Christian schools recruiting me that talked a little bit about religion, but they didn’t have a problem with me being Muslim. A lot of people guess I’m Muslim just from my last name, so they wouldn’t be surprised if I asked if there’s a mosque nearby or an MSA (Muslim Student Association) or something. US: You’ve had a pretty busy sports and training schedule over the years. Do you fast during Ramadan if it falls during a time when you’re involved in sports? MAH: Most of the time Ramadan is during a sports season or during training. So whenever I have a day when I’m not literally playing a sport, I’m fasting. I do the best I can. Sometimes I’ll fast after practice or before practice, but I always try to figure out some kind of way. US: Do you ever have any kind of conflict between practicing this peaceful religion but then playing a violent sport like football? MAH: When I’m on the field … I wouldn’t say I’m a whole different person, because I’m still myself … but my mentality is entirely different. I want to be able to dominate the person I’m going against. I do the best I can to come out on top. But when all of that is done and the game is over, I’m giving all the praise to Allah [swt] and giving Him credit. I’m never taking anything away from my religion. US: Seattle is a pretty big and diverse city, but when you go to college in a smaller town, you might be in situations where you’re the first Muslim person that somebody has ever met. Or you’ll be the only Muslim person they know. Do you feel like you have to be like a representative for all of Islam when you’re in those kind of situations? But the best thing I like is being looked at as a leader. I’ve always been kind of Godfathered into being a natural leader, whether it’s at home, school or on the court. US: After basketball season, what is your schedule going to be like between then and when you leave for college? MAH: My main focus will be staying on top of my grades and being in the weight room. I might get a job, you know, to put some extra money in my pocket. But the big focus is on grades and weightlifting; I want to put on some extra muscle. Then I head out to Western Oregon in August. US: What role have your parents played in shaping who you are today? MAH: My parents have played every role. How I carry myself emotionally, physically and mentally, that’s what they’ve done. My Mom and Pops are always on me, making sure I keep my room clean, stuff like that. They’re always pushing me, whether it’s school or sports, to get the best out of what I can do. My Dad gets on me hard about staying on top of my grades, because he’s not going to be there in college when I’m gonna have to take care of myself. As a whole person, I wouldn’t be who I am without them. My Mom has been there whenever I’m super tired or just emotionally not there, I’m always able to go talk to her. My Mom and Dad do a good job of holding me in one piece, keeping me solid. Whatever happens to me, the credit is going to them and to Allah [swt]. US: What was Signing Day like? MAH: It was amazing. You only get one Signing Day. I remember when my Dad called and told me I’d gotten into Western Oregon, I was super happy. I was like, “Yeah, I’m committing there.” I had a lot of friends and family there when I signed. It was amazing, one of the biggest highlights of my life. US: Are you ready for the next level? MAH: Yeah, I’m ready. After I committed, I was like, “Why can’t I just go there now?” (Laughing) But you can’t get lax after you make that decision. I have to stay on top of school just as if I was still trying to get into college. I still gotta get through high school and I still gotta do some weightlifting, but once I’m in college, I’m going to be all about business. Jummah — a congregational prayer that Muslims hold every Friday afternoon. Ramadan — the holy month of fasting for Muslims. It was during this month that Prophet Muhammad (peace be upon him) first received the revelations of the Quran. Way to go, Malik! So proud to see that you’ve fully matured into a very humble, young man – while diligently maintaining your faith. I have nothing but the very best of prayers for you during your ongoing journeys. I look forward to keeping up with your progress and hearing many more success stories. Keep up the hard work, and always stand out as a leader.